STORY: Indian fans on Thursday (November 01) were a confident bunch and hoped the hosts would seal the five-match series against the West Indies during the final one-day international (ODI) match in southern Thiruvananthapuram city. India arrived in Greenfield International Stadium on the back of a massive 224-run win against the Caribbean side. 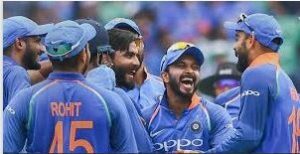 An Indian fan Anish said that if the Indian team scores at least 350 runs, then they will definitely be on course to win the series. Hosts India whitewashed visitors 3-0 in the test series and are now looking favourites to seal the 50-over series. West Indies are also scheduled to play three Twenty20 internationals in India before leaving for their Bangladesh tour.